Daisy just turned 8 years old and asked for an art party. I love throwing parties and have managed to keep my children’s parties at home. This keeps the cost down, allowing me to treat the party kids to fun activities. Instead of multiples of the the same gift we “echoage” our parties. This means we ask for a donation and echoage splits the money between a charity of our choice and Daisy so she can choose one big gift. Here is her certificate, highlighted by some cheeky foxes. ….place cards on the table… and to add to party hats. 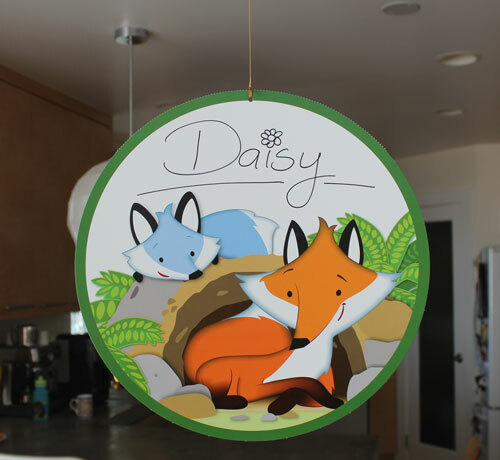 The Playful Foxes Two-sided Decoration hung over the table with Daisy’s name to personalize it. As the party guests arrived they were invited to make a puzzle using “Make your own Puzzle” and markers. When completed they were put in a labelled zip-lock to take home. Activities in the basement included free painting. Nature’s Attire Creative Paper was the basis of a beautiful oil pastel creation. The paper has an animal on one side and a closeup of the animal on the other. Fox cupcakes with fondant were of course necessary. The gorgeous birthday girl, trying to demonstrate everyone’s hat! The Playful Foxes range is available here should you wish to deck out your classroom.